The October block of the month turned out absolutely adorable! Congrats to the winner, Patti Auten. I can't wait to see the completed quilt. Linda walked us through a fun and easy block for November. You can find the instructions on the blog. Remember, the more blocks you make, the higher chance you have of winning. The SFMQG members who attended the Melissa Averinos workshop and lecture gave and overview and shared their projects from the class. Sounded like everyone had a great time and learned a thing or two. Thanks to everyone who helped organize the event. It's wonderful to see great teachers like Melissa visit our guild. Debby S. answered questions on the charm pack challenge. You can find the details on the blog here. Please reach out to Debby if you have any more questions. The reveal will be next month, at the December general meeting. 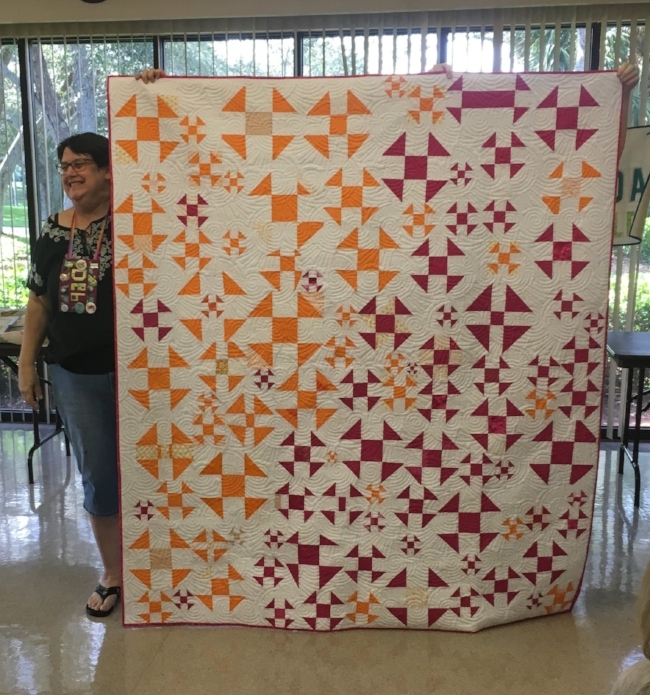 Our 2018 QuiltCon Charity Quilt was revealed at the meeting. What an awesome quilt! A huge thanks to Karla (piecing), Debbie K (quilting), and Kerri Lynn (binding) for all their hard work in finishing the quilt. And a thank you to all the guild members who contributed the blocks. A committee has been formed to decide how where/how the quilt will be donated. There was a call to action to fill the 2018 board. We are lucky enough to have had a member step up and volunteer for every position. Every candidate ran unopposed and was unanimously elected. You can read more details about each of these individuals on the blog post introducing them. Thanks for your dedication to the continued success of the SFMQG! Rose Parson won name tag drawing. Don't forget to wear those name tags! Hope everyone is having a fun holiday season and I'll see you at the next general meeting.